Myrdin is quite tall for a half-elf, standing at 6’2". He has green eyes and black hair, with a closely cropped black beard. He is usually seen wearing a long leather coat and carrying around a strange stone skull. Myrdin was born in a dirty little village, and orphaned soon after. As a non-human, he was the target of constant abuse, and had nobody to turn to. When he was seven years old, he ran away from the village, disappearing into the forest. Myrdin had no wilderness skills, and was soon faint from hunger. During what he thought would be his last night alive, he saw a group of pixies dancing through the forest. Fascinated, he followed them, trying to stay hidden. The pixies quickly became aware of him however, and started dancing around his head, faster and faster until they were a blur. At that point the world shifted and Myrdin found himself in the Feywild. Fresh fruit was plentiful in the feywild, so there was no more immediate danger. Intrigued, Myrdin started to explore and eventually came to a large clearing in the forest. In the centre of the clearing was an open stone structure with a large well in the middle. Myrdin wanted some water, but quickly found that the well didn’t contain water, but instead an image of the universe itself. He would have been lost forever in that image if something hadn’t bitten him on the ankle. That something turned out to be a skull, who promptly introduced itself as Gildas. 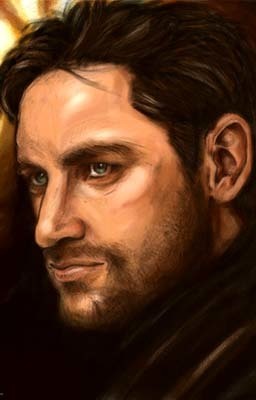 Gildas is a former servant of the Feylord Embries, the clearing they were in used to be his home. Gildas took a shine to Myrdin and started teaching him how to tap the power of the well (the source of Embries’ power). Gildas also took Myrdin throughout the Feywild, introducing him to all the Fey lords and ladies, as well as the native Eladrin and Gnomes. Myrdin became a social butterfly, and was always welcome at the best parties. Eventually, Myrdin grew tired of the endless parties, and decided to return to the natural world. Once there, he devoted himself to the pursuit of knowledge, as well as opportunities to train his ever growing powers.